Kicking off the final day was a conversation with Biz Stone, one of the founders of Twitter, which owes much of its success to SXSW, and creator of the social search engine, Jelly. Biz discussed the philosophical approach he has taken to creating his new startup, thinking much more about what the future holds for search and the power of crowdsourcing and social, above computer algorithms. Stone even told us of how he used his app, Jelly, to find out how many calories were in a piece of bread much faster than Stephen Woolfram was able to. Although we bet Woolfram was much more accurate. Following Biz Stone was past (and possibly future) first daughter, Chelsea Clinton, who discussed the work of the Clinton Foundation. Clinton highlighted how access to clean water is very much taken for granted, and that 750,000 children around the world die each year because of lack of access to clean water. You can donate here to make a difference. Clinton’s presentation was extremely refined, but as we learned from the session, it would be, as she has been debating with her parents since the age of 6. 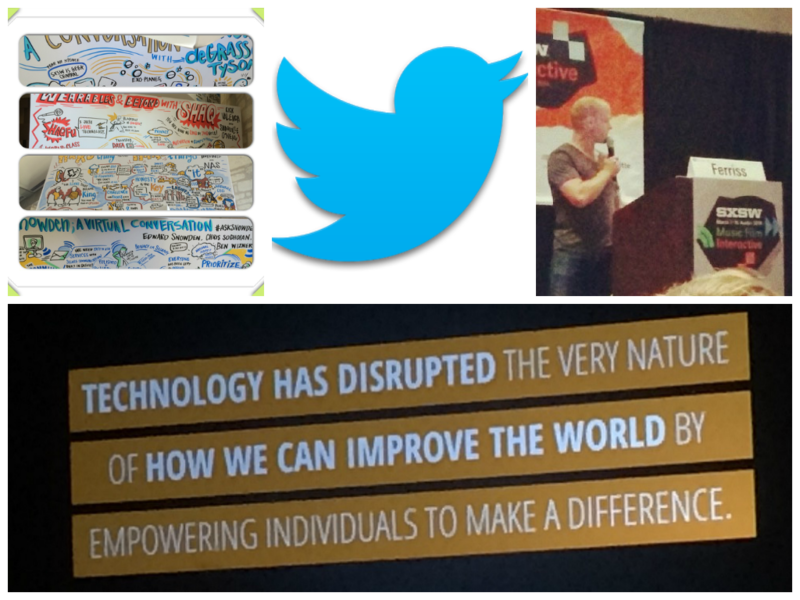 The final session of the final day of SXSW was lighter hearted, but still jam-packed with learnings. It was with Tim Ferriss, author of the 4 Hour Work Week, 4 Hour Body and 4 Hour Chef. Ferriss is infamous for challenging himself to learn new skill and put his body to the test, and with his latest TV show, The Tim Ferriss Experiment, he is taking just 5 days, week after week, to learn a new skill. So how does Ferriss do this? He claims to decode and de-construct everything to its basic level, so he can identify what little amount of effort he can put in for the maximum gain. For example, Ferriss learned one song on the drums and a byproduct of this was that he learned the drums. To learn to wrestle, he learned the best finishing move and focused solely on that. This can be used by you to learn new skills too; if you want to learn a new language for example, just learn one chapter of a book in the language, and you’ll be 80% of the way there. SXSW 2014 has been an absolute blast and we hope you’ve enjoyed our blog posts throughout the week. If you’ve never been, check out Martina Campbell’s blog post on her experience of SXSW for the first time.